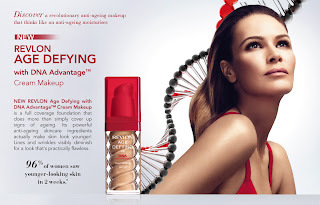 Il nuovo Age Defying with DNA Advantage di Revlon combina il trattamento make up al trattamento anti età di un trattamento cosmetica aiutando il DNA della pella a lottare contro i segni del tempo. Il 96% delle donne che hanno provato questo prodotto l’hanno definito ineccepibile, con una pelle più giovane in due settimane. Segni del tempo e rughe sono ridotte e la pelle è fresca, idratata e rivitalizzata. Come può questo prodotto aiutarmi? · La crema fondotina si occupa delle rughe, del colore dell’incarnato e della scopertura delle imperfezioni. Mi piace molto il packaging del fondotinta, visto che ricorda molo le eliche del DNA. New Revlon Age Defying with DNA Advantage Cream Makeup combines makeup + powerful anti-aging skincare to help protect skin's DNA to fight the signs of aging. 96% of women saw flawless, younger-looking skin in two weeks. Lines and wrinkles are visibly diminished while skin is refreshed, hydrated, revitalized. How does Revlon Age Defying with DNA AdvantageTM help? · SPF 20: provides broad-spectrum protection from UV rays by absorbing and dissipating as well as physically blocking UV rays from penetrating the skin. This helps protect the integrity of your skin’s DNA. · Vitamin B3, Vitamin E, and West Indian Cherry Extract, plus highly effective humectants: helps retain water balance in dry skin, leaving you with skin that looks and feels younger and softer. · Cream foundation: provides flawless, moisturizing, complete coverage to even out skin tone and hide imperfections.